﻿ PowerDyne Arius Platinum Plates - $349.00 : Bruised Boutique, For Derby. By Derby. 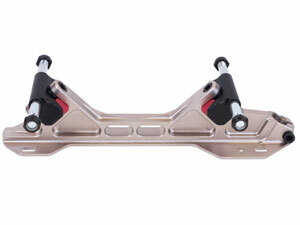 The Arius from PowerDyne is a complete reinvention of the quad roller skate plate. The patented Arius is lighter, stronger, more stable, more powerful, more maneuverable, more durable, and more efficient. It is also simple to set up! Unmatched stability and response in a simplified, revolutionary design. 6061 series heat-treated lightweight extruded aircraft aluminum for optimal strength. Unique Butterfly Cushion design requires no adjustment, simply install and start skating. 4 sets of high rebound urethane Butterfly Cushions for exact tuning: 74A / Aqua, 80A / White, 86A / Yellow-Green (pre-installed), and 92A / Red.